Not only are stunts cheaper to execute than traditional press releases or advertising, but they’re more fun. They give a brand a chance to make a statement and show a little personality. So in addition to the new eyeballs you draw in, you’re strengthening your position in the existing audience’s mind. In our case, we wanted to show our fans that we’re real people — silly, sly, and a little irreverent. 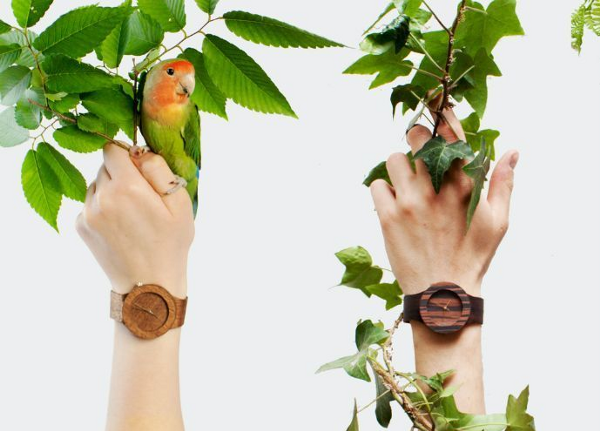 Analog Watch Co.’s brand identity is “inspired by nature.” We use natural materials like wood and marble in our designs. The joke for this stunt is that we’d be using live animals “to remind the wearer of the beauty of nature” — intending to elevate the natural world while unwittingly killing and commodifying it. 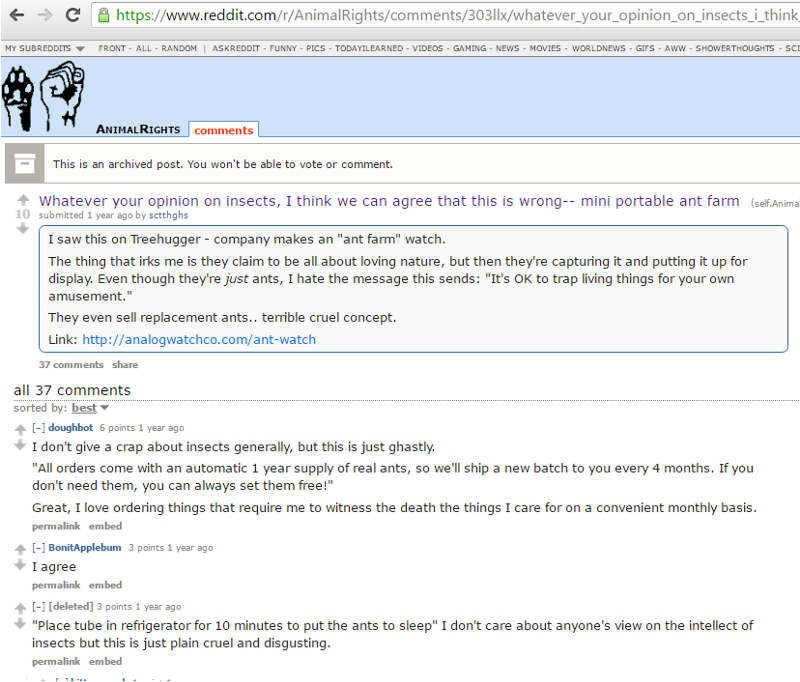 Inspired by those iconic green ant farms, we need to turn this concept into a mock-up that we could promote. There are a few reasons why this would never work as a real product, but we expected that people wouldn’t think too hard about it. The page on our website had a major clue that this was all a prank: We were not actively taking payments — the only way visitors could order was by signing up for an email list. We promised to notify them when orders opened on April 1, 2015. Our business has meaningful press connections with relevant local blogs, communities of watch enthusiasts, and design taste-makers, so the obvious move would be to comb through our Rolodex and pitch the hell out of all the relevant contacts. But we knew while this might get us some traction, we needed something else to truly amplify our message and create a more remarkable spectacle. People onlineIf people online are good at one thing, it’s getting pissed off about the cause-du-jour. We had to piss some people off. Internet traffic is driven by emotion. The higher the emotional valence of a piece of content, the faster it spreads. And of all emotions, anger is probably the most provocative. It’s so powerful that among certain group, it can seem like people are just waiting around for an excuse to get outraged. They’re on a hair trigger, and all it takes is a small group of people to have a strong opinion about something, and others will jump on the bandwagon. Animal rights activists are notorious for this sort of behavior, and therefore the perfect group to target and help us spread the word about our brand. I posted this on Reddit from my personal account. Despite being a relatively small subreddit (<9k subscribers), this simple comment provoked 37 comments and hundreds of visitors. 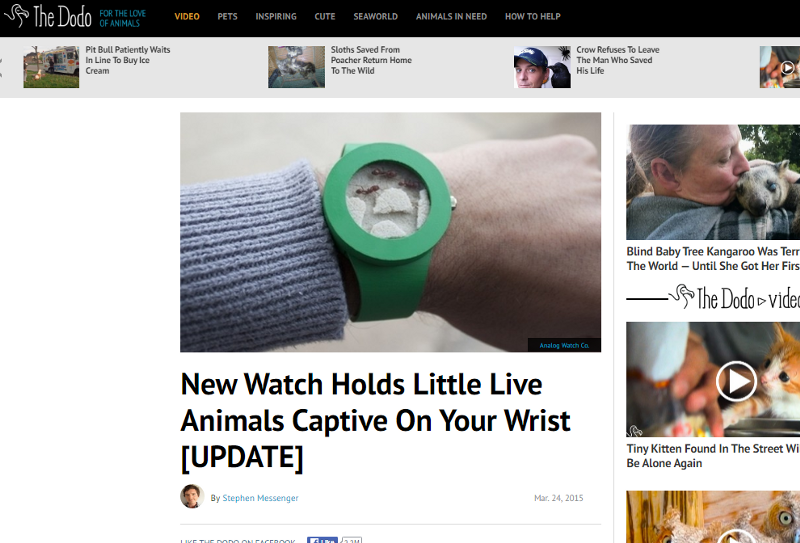 The Ant Watch never actually appeared on Treehugger. This was a flat-out lie. But of course nobody bothered to check. The need to get angry outweighed the need to find out the truth. Once it had gained some traction on Reddit, the story was ripe to be pitched to bloggers. It was absolutely crucial to put it on Reddit first rather than pitch it as a press release. A release isn’t a story; it’s a promotion. But even after just a couple hours, we have something better. We have a debate. Here’s where the second lie occurs. A created a Gmail account under a fake name and pitched to several larger animal rights blogs, breathlessly explaining how I saw this thing on Reddit about how this awful company was making this terrible product, etc. The goal was to create the impression that a conversation was happening on it’s own, bubbling up from the depths of the internet. This is catnip to bloggers. And of course one of them bit. 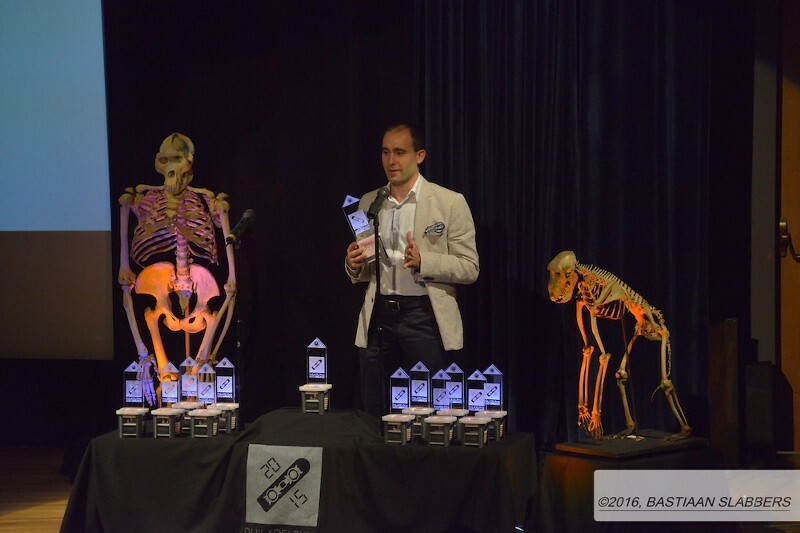 The Dodo is one of the top animal rights blogs on the internet. This article received hundreds of comments and sent thousands unique visitors our way. They even called and interviewed our CEO. The call caught him off guard, but he expertly held his ground and didn’t blow the prank. From this one post, we knew that other blogs would pick it up and get attention. We’ve seen how media outlets seem to recycle the same content over and over, so we let the controversy run its course and tallied our results later. We saw a 15x (1,500%) increase in traffic over the course of this stunt. The video alone got over 110k views on Youtube. Hilariously, we had two petitions on change.org urging us to halt production. All in all, it seemed that about half the people got the joke because they recognized that the product was just too preposterous, or because they saw the “launch date” of April 1 on our website. A number of them left comments to make fun of the other oblivious half in the comments, which was funny. We beefed up our lists significantly: Close to a thousand new signups to our mailing list and tens of thousands of visitors who activated our retargeting pixel, who we market to using the Facebook and Adroll networks. In addition to major outlets like Yahoo! 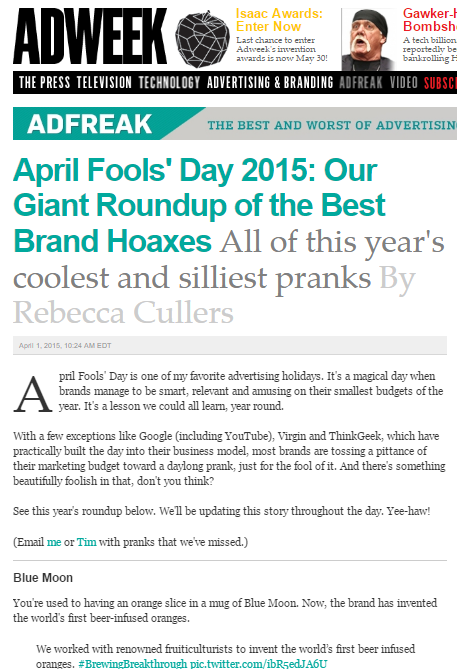 and Telegraph.uk, we were thrilled to be included in Adweek’s “Giant Roundup of the Best Brand Hoaxes”, where we were featured alongside major brands like Samsung, Pizza Hut, and Reebok. Might all this have happened without our manipulations? Maybe, but I think it’s unlikely. We definitely could have had some local press and some coverage on design/watch blogs, but it would have been strictly niche. The real key, and the reason that the controversy blew up was because we supplied the spark. We were covered initially because we were able to give the illusion of a spontaneous conversation happening about the Ant Watch. We made the product newsworthy ourselves, rather than cross our fingers and wait for a news story to develop. That said, we were absolutely stunned by how fast everything happened. From the initial Reddit post to coverage on TheDodo was only a matter of hours. Once we were on there, other sites were very quick to grab onto the story and post their own take on it (often times just a verbatim repost) within about 36 hours. Ultimately this worked in our favor — since we launched a few days prior to April 1, the rapidity of the coverage helped us spread further before the hoax was revealed. Posted on October 30, 2015 by scott.h. This entry was posted in Marketing, Product Development. Bookmark the permalink.